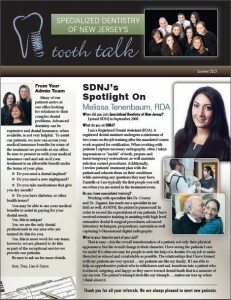 Specialized Dentistry of New Jersey is proud to share our Summer 2013 Newsletter. There are lots and great pictures and information about our team, our patients, and our dental practice. If you would like a copy of the newsletter mailed to you, please send us an email via the CONTACT US form.